With a stay at Kingsmere Guest House in South Shields, you'll be minutes from Arbeia Roman Fort and close to Blue Reef Aquarium. This guesthouse is within close proximity of Ocean Beach Pleasure Park and The Customs House.Rooms Stay in one of the guestrooms featuring flat-screen televisions. Bathrooms have complimentary toiletries and hair dryers. Conveniences include coffee/tea makers and complimentary bottled water, and you can also request irons/ironing boards.Dining A complimentary breakfast is included.Business, Other Amenities Free self parking is available onsite. This smoke-free hotel offers bellhop services. Located in South Shields, Little Haven Hotel is by the sea, within a 10-minute drive of Arbeia Roman Fort and Marsden Rock Bird Reserve. 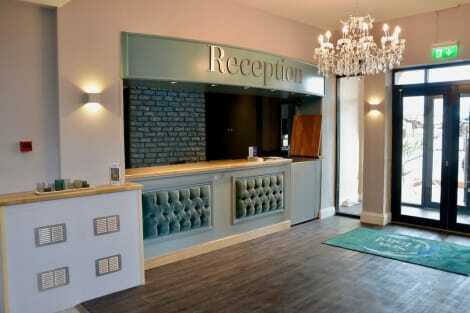 This beach hotel is 11.5 mi (18.5 km) from Quayside and 7.5 mi (12.1 km) from Port Of Tyne. At Premier Inn Hotel South Shields (Port of Tyne), the buzzing centres of Sunderland and Newcastle are close by, as well as incredible national parks. Whether you're here for work or for pleasure, you'll find there's so much to do. Go for a personal best on the Great North Run. Or get up close and personal with some great surf along the North East's unspoilt coastline. Go back 1300 years at Bede's World. Or catch the very latest bands at the three-month-long South Tyneside Summer Festival. Lovely food awaits at our onsite Taybarns restaurant, as well as our spacious rooms and extra-comfy beds. Make use of convenient amenities such as complimentary wireless Internet access, a picnic area, and a reception hall.